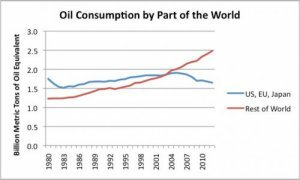 Peak oil is dead, we all know that by now. Or is it? Oil prices are certainly not coming down despite years of recession and stagnant demand in OECD countries. 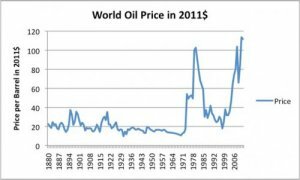 According to Gail Tverberg, who runs the blog Our Finite World, prices are so high because oil exporters need ever more money to fund their expenditures. The problem is that oil importers increasingly cannot afford those prices anymore: they are disguising the effect of high oil prices by keeping interest rates low and running up debts. These trends cannot continue: they will, says Tverberg, result in a clash that will have a crushing impact on economic growth. We live in a finite world. Clearly, a finite world has limits of many kinds. Yet economists and other researchers use models that assume that these limits are unimportant for the foreseeable future. 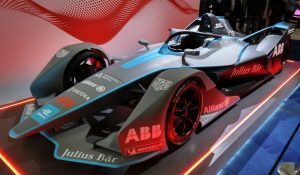 They have certainly not stopped to think that any of these might be very hard limits that are difficult to get around, and furthermore, that we might be reaching them in the next year or two. What are the hard limits we are reaching? One of the main ones is that at some point, there is a clash between the oil prices importers can afford, and the amount oil exporters require. In fact, there can even be a conflict between prices producers in a non-exporting country like the US or Brazil need, and the prices citizens can afford to pay. Oil exporters need ever-higher prices, partly because the cost of extraction continues to rise, and partly because oil exporters use taxes from oil to fund public works projects and to keep their many unemployed citizens pacified. The Arab Petroleum Investment House estimates this combined cost  for OPEC countries to be increasing by 7% in 2013. Required prices by oil exporters are already in excess of current market prices for some countries, making the situations in these countries less stable. Examples of countries needing higher oil prices than current prices to balance their budgets include Nigeria, Venezuela, Iran, Iraq (APIH report ) and Russia (Deutsche Bank  estimate). There is evidence that the collapse of the Former Soviet Union in 1991 occurred when oil prices dropped too low. The Soviet Union was an oil exporter, but with the low oil prices, it could not afford to make investments in new productive capacity. It also could not afford to fund government programs. The collapse did not happen immediately, but happened after low prices had sufficient time to erode funding. Ultimately, the central government collapsed, leaving the individual state governments. See my post, How Oil Exporters Reach Financial Collapse . How Do Oil Importers Reach Price Limits? According to most economic theory, oil importers should never reach a price limit. If higher prices occur, as they did in the 1970s and early 1980s (Fig. 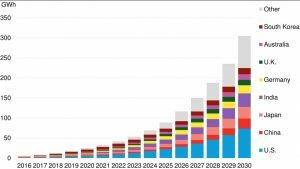 2), these higher prices should quickly lead to conservation, plus greater oil extraction and the development of substitutes. Figure 2. World oil price (Brent equivalent) in 2011$, based on BP 2013 Statistical Review of World Energy data. In fact, in the late 1970s and early 1980s, high oil prices did lead to changes of the expected kind. 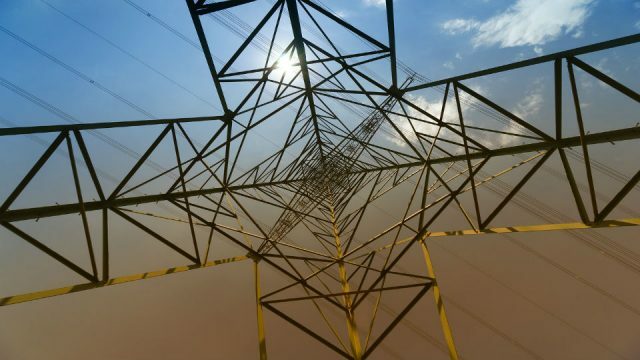 It was possible to replace oil-fired electric power plants with coal-fired power plants or nuclear electric power plants. It was also possible to replace the very large, fuel inefficient cars that US automakers were making with more fuel-efficient cars, including ones that Japanese automakers were already making. In addition, it was possible to quickly bring additional inexpensive oil on-line, such as from Alaska (Figure 3) and the North Sea. The decline in the 48 states production (excluding tight oil) was never really fixed. Figure 3. US crude oil production, divided into “tight oil,” oil from Alaska, and all other, based on EIA data. 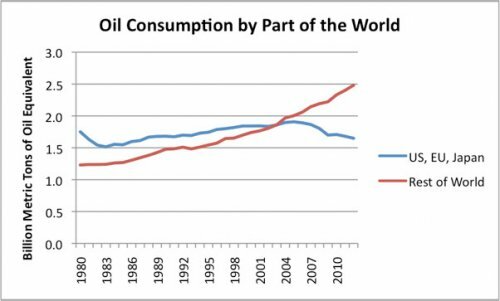 More recently, there has been much less success in increasing world oil supply. 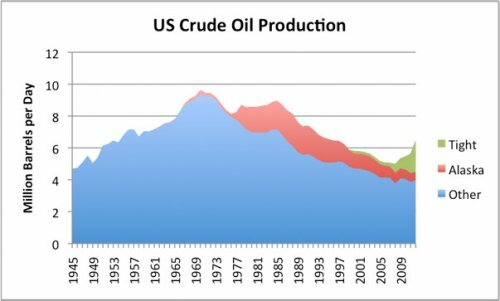 Higher oil prices eventually led to some new production, such as US tight oil (green in Fig. 3). 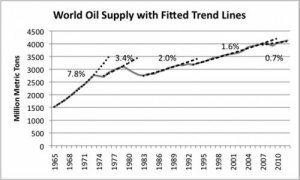 But even with the new US tight oil production, world oil supply has not risen very much (Fig. 4). Figure 4. 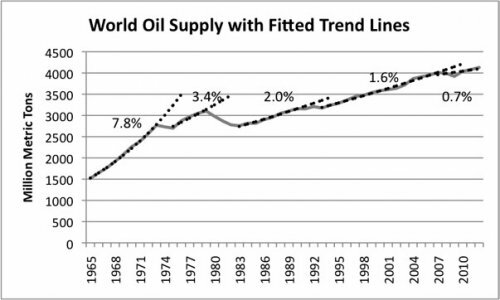 Growth in world oil supply, with fitted trend lines, based on BP 2013 Statistical Review of World Energy data. It is not clear how long the current run-up in tight oil production will continue. Current production is enabled by high oil prices, available credit, and low-interest rates. Even these may not be enough: a recent headline says, Shale Grab in U. S. Stalls as Falling Values Repel Buyers . What happens when oil prices rise, and no additional supply or substitute is available? Economists tell us that when oil prices rise, and no additional supply or substitute is available, demand destruction occurs. It turns out that demand destruction for oil corresponds to what most people would call “recession“. It is as if the economy shrinks to a smaller size, so that less oil is required. This economic shrinkage takes place in a number of ways. Higher oil prices make oil less affordable for consumers, businesses, and governments. The indirect result of this is job layoffs, because consumers cut back on discretionary items, such as vacation travel and eating out at restaurants. Governments cut back on projects like road repair, laying off workers. Businesses find they need to raise prices of goods they sell, because of the higher prices they pay for oil. The result is that their products are affordable to fewer consumers, again requiring laying off workers. So the net result is job loss, and continued weakness in hiring, such as the US has seen for several years now. Governments are particularly affected by high oil prices, because with fewer people working, government tax collections are reduced. More people file for benefit programs, such as unemployment or disability coverage, when they cannot find work. This adds to government funding issues. If banks fail, governments may be called to bail them out, also adding to government expenditures. There have been academic studies showing that high oil prices tend to create recessionary impacts. James Hamilton has shown that 10 out 11 post-World War II recessions were associated with oil price spikes . He has also shown that oil price changes in the 2005-2008 period were sufficient to lead to the Great Recession (Brookings Paper ). I have also written a related academic paper, Oil Supply Limits and the Continuing Financial Crisis . Because of these issues, if high oil prices remain after a recession, we should expect continued recessionary impacts, such as an inadequate number of jobs for young people and growing government debt. The government can cover up these issues to some extent with ultra low interest rates. In fact, such low interest rates, together with continued deficit spending, seem to be the reasons the US has been in “recovery” since the Great Recession officially ended in June 2009. However, we still find (Fig. 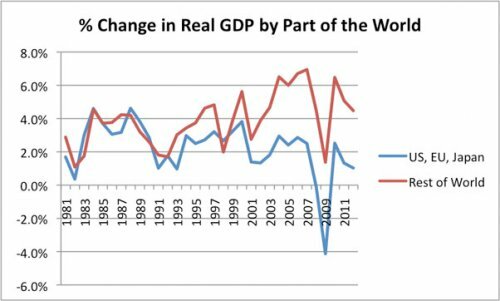 5) that the big oil importing countries (US, UK, and Japan) have much lower GDP growth in recent years than the rest of the world. Figure 5. 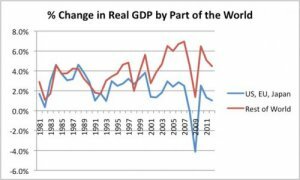 Annual percent change in Real GDP by part of the world, based data of the USDA. These countries also have much less growth in oil consumption than the rest of the world, indicating that when it comes to oil consumption, citizens and businesses of the US, EU and UK are being outbid by businesses and workers elsewhere. Figure 6. Oil consumption based on BP’s 2013 Statistical Review of World Energy. Workers elsewhere may use less oil per person, but because they have jobs, they are able to purchase new scooters and other goods they want. Their employers also use oil to make and ship goods, keeping their demand high. In the US, EU, and Japan, we continue to lose jobs to automation and to outsourcing to low wages countries. As a result, wages are stagnating, and young people are having a hard time getting jobs, making oil less affordable. 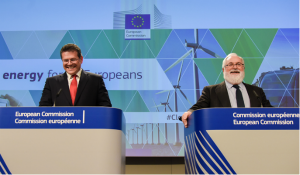 If only there were more high-paying jobs… Of course, in a globalized world using coal as a primary fuel, the goods we would make would be too expensive for the world market. Oil importers around the world are disguising the effect high oil prices are having on economies, through low interest rates and continually rising debt. In doing this, oil importers are able to keep the price of oil that they can afford high. In other words, using these techniques, oil importers are able to keep the blue “affordable by importers” line high in Figure 1. At some point, there is a limit to how much the adverse impact can be disguised. The following are several areas where limits are now being reached, that will tend to bring down the “affordable to importers” line in Figure 1. 1. Limits on the amount of governmental debt. In the US, the need to raise the federal deficit cap will come up again as soon as October . There will be pressure to try to reduce spending, to reign in the federal deficit. If the economy were growing faster, the debt limit would be less of an issue. But with continued high oil prices, growth is slowed. Debt limits can be expected to continue to be an issue. 2. Slowing growth, and related debt limits, in developing countries. High oil prices affect importers or all kinds, even developing countries that use less oil as a percentage of their total energy consumption. The slowing growth also makes debt harder to manage. News sources are talking about slowing economic growth in China , India , and Brazil. A recent WSJ article about China is titled, Debt Drags on China’s Growth . According to the article, interest and principal payments on business and household debt currently absorb around a third of China’s GDP. Some debt is being taken on, just to allow interest on past debt to be paid. These high debt levels may cramp future growth in China. 3. Rising longer-term interest rates, because of scaling back or ending quantitative easing. As noted above, low-interest rates are helping to cover up our current issues of inadequate good-paying jobs and inadequate government revenue. 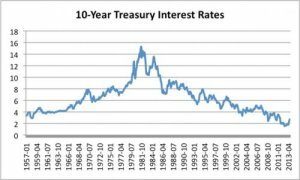 If interest rates rise, the government will need to pay more interest on its own debt, leading to a needed tax increase. Figure 7. Ten year interest rates based on data of the Board of Governors of the Federal Reserve System. Another effect of rising interest rates is that the market value of bonds outstanding will fall. This happens because the price of bonds is adjusted so the new owner will get the current (higher) yield to maturity, instead of the original low yield to maturity. 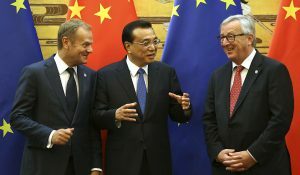 Owners of bonds, such as the Chinese and Japanese, are aware of this, and have started selling their treasuries, before prices fall further. (See Reuters: China, Japan lead record outflow from Treasuries in June .) This type of sale of treasuries tends to raise the yield on treasuries, even before the Federal Reserve actually cuts back its monthly purchase of securities under quantitative easing. If interest rates on 10-year treasuries rise, mortgage interest rates will rise, cutting back on the number of families who qualify for loans for new or resale homes. Last week there were articles saying, “New home sales plunge 13.4% ,” presumably from the amount by which interest rates have risen already. If interest rates rise enough, there may also be a decrease in the value of resale homes, because there will be fewer buyers who can afford move-up homes, lowering demand for homes. 4. Popping of asset bubbles, as a result of rising interest rates. At least part of the rising value of assets of many types (stocks, homes, farms, oil and gas leases) is likely to be related to the very low-interest rates recently experienced. 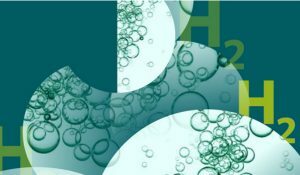 Bubbles tend to occur, because with debt earning very low-interest rates, borrowers are anxious to earn higher rates of return, however they can. Investors bid up prices using money borrowed at low-interest rates, in hope of making capital gains later. Of course, if interest rates rise, all of this may “turn around”. 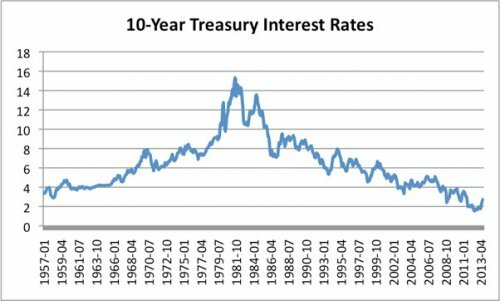 One piece of evidence regarding the effect of rising interest rates on stock market prices, versus falling interest rates, for the period graphed in Figure 7, is the following: During the period 1957 between to 1981, when interest rates were rising, the S&P 500 rose by less than inflation. In contrast, during the period 1981 to 2013 when interest rates were falling, the S&P 500 stock market index averaged a gain of about 5% per year, over and above the inflation rate. The difference is in the direction a person would expect, and is quite large. As we reach financial limits of many kinds, further recession, possibly quite severe, seems likely. Some of the limits are ones we have not encountered before, particularly the one with oil prices being too low for exporters, but too high for importers. This makes the situation particularly frightening. At some point, the clash between the price oil importers can afford and the amount oil exporters need could cause oil production to drop dramatically, over only a few years. Such a drop in oil production would likely have a very adverse impact on economic growth. If oil limits indeed reduce economic growth, this makes models based on the assumption that the future will look like the past invalid. Instead, we need to expect a very changed world. At some point, we may even reach permanent contraction, as oil limits change the nature of the world economy. Gail Tverberg has an M. S. from the University of Illinois, Chicago in Mathematics, and is a Fellow of the Casualty Actuarial Society and a Member of the American Academy of Actuaries. She is involved with oil and other limits as a researcher, an actuary and an educator. She runs the blog Our Finite World.